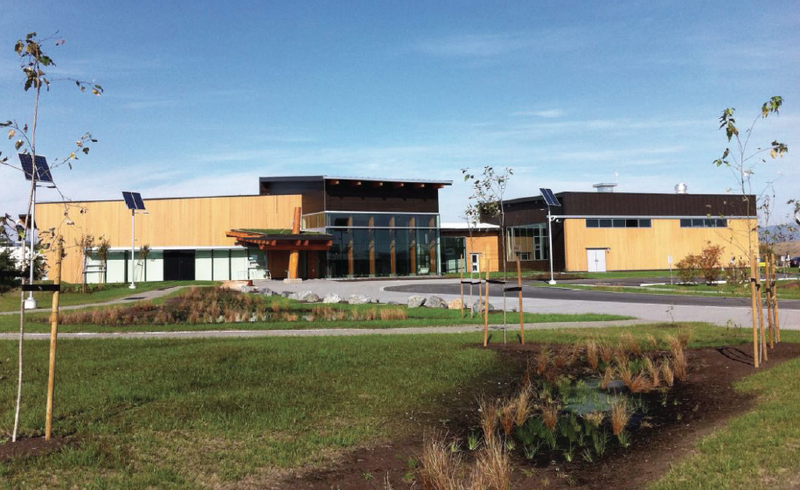 The Annacis Wastewater Centre is the first of Metro Vancouver’s Sustainability Academies to be built. It is a unique facility that blends research, education and training opportunities in a building and its surroundings while exemplifying leadership in sustainability. The AWC will provide top-quality laboratory facilities for research, teaching space and access to various in-plant wastewater streams for manufacturers and suppliers of equipment to demonstrate processes, as well as pilot facilities for optimizing full scale processes. In addition, AWC contains multi-purpose meeting rooms and a classroom providing space for public discourse, education, training and other professional services. The mechanical system consists of a variable air-flow heat recovery ventilator providing outdoor air to classes via fan powered VAV units and to other spaces via variable flow air valves. Offices and ancillary spaces are heated and cooled with under-floor radiant systems and the laboratories are heated with fan coil units. Heating and cooling is provided by electric water source reversible chillers that reject or absorb heat from the wastewater downstream of use in experiments in the laboratory. Recollective was brought in to the project as the LEED Energy Model Reviewer to provide a CaGBC-approved peer-review of the project’s energy model.